Start by grabbing an old or inexpensive candle of choice! 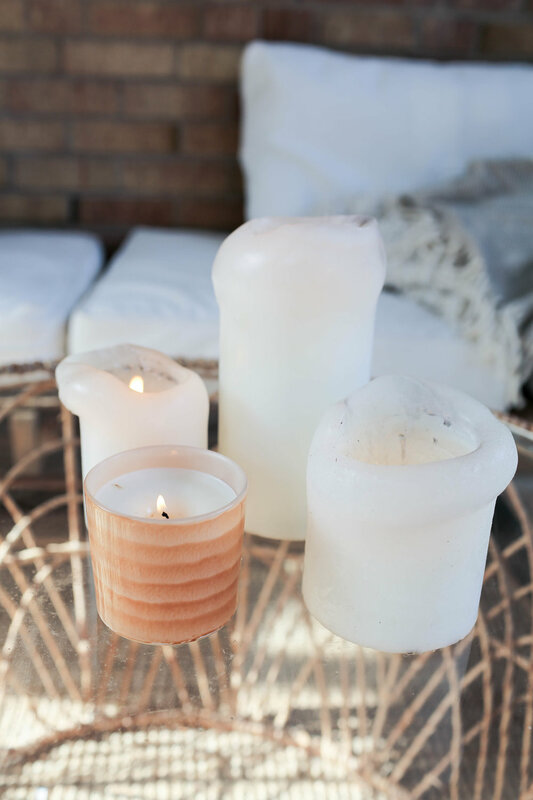 Try and choose a candle that has a light scent, as a heavily scented candle might attract more bugs than your citronella is going to keep away. Go ahead and place the candle half-deep in a pot of water, and boil until the candle is melted. Once the candle is fully melted, carefully remove it from the water and add several drops of citronella essential oil! Go ahead and use a pair of pliers to straighten the wick if it has fallen over, and allow to harden. And that’s it! The perfect way to upcycle any candle into a citronella candle! Start by finding a place for your net to hang while you are making it. Knot your rope around a key ring, measure out 6 feet, cut and tie that end around your other key ring. Next cut 34 strings that are 7.5 feet long each. Once all your strings are cut, loop them onto your horizontal rope using this technique. We’re basically folding the rope in half and pulling the loose ends through the loop created at the halfway fold. Once they’re all looped on, space them evenly apart, about two inches apart. First were going to show you how to make a cute chain knot across the top of the net. Hold two strings at the end of the net in your left and right hand. Pass the left cord over the right, pull tight to the left. Your left now becomes the new right and repeat. “Left over the right, pull tight to the left.” Once the top chain is made, we can start macrame-ing. Working in groups of 4 strings at a time, we’re tying knots around the two middle strings with the two outer strings. Cross the left string over the two middle and then bring the right string over the front, around the back, and through the hole created between the left string and the middle. Pull tight. Next start with the right rope, bring it in front of the two middle, and then bring the left over the front around the back and through the hole created between the right string and the two middle. Repeat this knot two more times, alternating which side you start on each time. Once completed, move over to your next set of four ropes and repeat, tying 4 macrame knots. Once you’ve gone all the way across the net, move down to start your next row. This time skip the two outer ropes and start with the four ropes following. This will ensure our knot pattern is offset on every row. Once we completed 4 full rows of knots, we did a 5th final row but this time only did two knots per group of 4 strings. To finish the net, we did a simple fishtail braid with the 4 strings and knotted it off at the bottom. Trim the ropes to be the same length and your net is complete! (Watch the video below for a visual of what’s going on here!). Once you get to your location, find two trees to tie your net to and get playing! This net is great for badminton, volleyball, or any other fun outdoor game or party. Citronella candles can only do so much, and bug spray isn’t great to spray on your pets because it can get in their eyes or mouth. SO, to stop your little buddy from getting attacked by bugs, we’re going to make them a little bug spray bandana! Start by grabbing a bandana (or any piece of scrap fabric of choice) and spraying it with bug spray. Go ahead and tie the sprayed fabric around your pet’s neck, and they are ready to hang out outside all day! This next hack is a super fun and inexpensive way to create the MOST cozy and chill backyard hangout spot without having to buy furniture. Start with a kiddie pool! This can be a handed down pool, or purchased from Amazon. Blow up your pool and add any fun pillows or blankets to it! Another fun tip is to add towels inside of the pool to act as a post-water oasis. Check it out, how cute! The next DIY involves using something straight from your recycling bin *yay*. Honestly how many times have you been hanging out with your friends in the summer and just needed some way to cool down like the old days? A pool or sprinkler (for those of us sans pools) is a summer must. To make this quick recycled sprinkler, first we made sangria :) ... then we used the large plastic pop bottle as the base of our sprinkler, and then you begin poking holes. 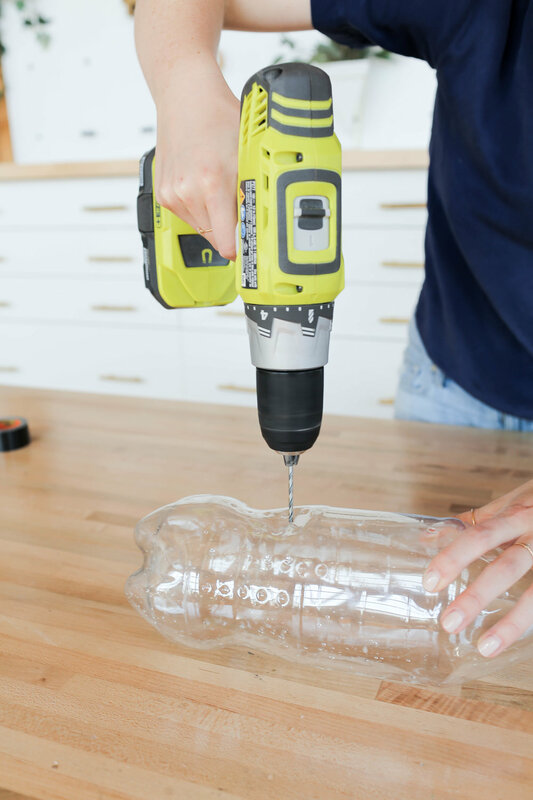 We started with an awl but quickly learned that a really small drill bit will create holes effortlessly and not destroy or crinkle your bottle in the progress. Once we had 3 rows of 5 holes we were done! And that’s it! If you liked this blog post, go ahead and check out the video below! If you try any of these DIYs or hacks, be sure to show us using the hashtag #SorryGirlsSquad!